When someone’s complexion is complimented as ‘Milky White’, this is the testimony, he / she is blessed with a perfect skin. It is all the same with teeth. But what about ‘Milky White Eyes’! When it comes to white eyes, the inference takes a turn and the person ascribed with the phenomenon is either having cataracts or he’s dead. 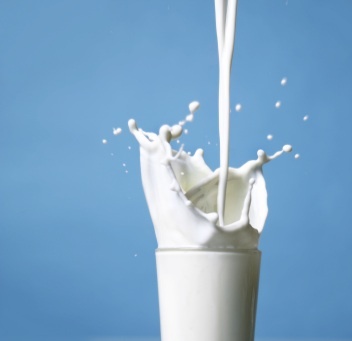 Some forms of milk have more lactose (commonly referred to as ‘milk sugar’), others may not. The WHITE color of milk owes its opalescent appearance because of the presence of ‘Casein’ molecules and globules of fat that deflect light passing through milk. In other words, it’s a kind of optical illusion that we see it white because of ‘Casein’, the essential white pigment, reflects the white light back to our eyes, as it can’t absorb the sun rays at all. This implies that the more milk appears whitish, the more fat will it contain and vice versa; in the latter case it would look grayish. Vitamin D and Calcium are very vital constituents of milk owing to which milk is popularly branded as a health-giving diet. Just one liter of milk contains as much calcium as 21 eggs, 12 kg of lean beef, or 2.2 kg of whole wheat bread. Calcium and Vitamin D strengthen our bones. On a commercial scale, we need to obtain milk from cows. Before storage, milk, after extraction from the cow’s mammary glands, is cooled at 40o F. Cows employed for commercial milk are known as ‘dairy cows’ and so is the milk. They are bred differently and fed differently because a dairy is to get optimum quantity of milk from a cow through the application of scientific methods. In this respect New Zealand stands worlds first ranking dairy milk producer. The feed of a cow is rich in contents such as fats, water, proteins, carbohydrates, vitamins and minerals. After passing through reumen, reticulum, omasium and abomasums, parts of a cow’s digestive tract, the food contents are decomposed into enzymes. An average dairy cow can milk some 8 to 12 gallons a day. To stop osteoporosis in women in their post-menstruation life, nutritionists recommend at least 2 glasses of milk daily. Same recommendation holds for the women having given birth. When it’s a matter of perfect health, no other diet can surpass a mother’s milk. Research has revealed that a lactating mother’s feed is nutritious for ADULTS as well. Kids aging 1-12 years are prescribed 3 glasses of milk on daily basis, and the same quantity for adults aging 21 to post 50s. Similarly, chocolate milk has almost same nutrients as ordinary milk; only the difference is that white chocolate has more energy than that of a common bar. One who doesn’t like to drink milk may be advised a yogurt’s treat. Yogurt offers you all the rich food contents of healthy milk in addition to a pool of useful bacteria. Smokers lose vitamin and calcium more quickly, so they are strongly advised to take sufficient quantities of milk. White milk is the best option as nutrient for those who want to build up their figure but with a little check on fat intake. Those who cannot digest lactose as the case is with many Asian countries, soya is the best alternative; it contains the same amount of calories.